Tree Doctor | Hanatoyo Landscape Co.,Ltd. Trees get old and sometimes sick, just like humans. They need specialized (called medical, in case of humans) treatment and those who are skilled in the cure are called Tree Doctors. 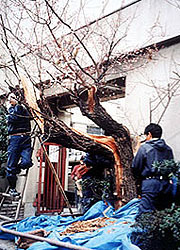 We had been very attentive to this aspect of landscaping, even before the Tree Doctor state license system was institutionalized in Japan. 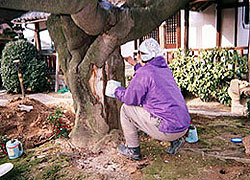 Today, three of our experienced Tree Doctor license holders actively visit trees all over Japan to examine, diagnose and offer ensured and proper treatment based on the latest research findings. We do not diagnose just by targeting the tree. The surrounding environment is crucial to the well-being and long life of trees, just like of humans. Engineering works near the trees for instance is a common cause for the unintentional damage to them. Feel free to consult with us. From a giant age-old tree in your community to a young one in your private garden, we are ready to visit them.